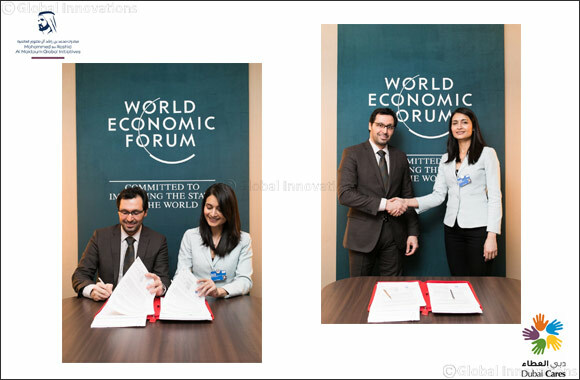 Dubai, United Arab Emirates –January 27, 2019: Dubai Cares, part of Mohammed bin Rashid Al Maktoum Global Initiatives, has announced a new strategic partnership with the World Economic Forum (WEF) during its annual meeting in Davos to support the reskilling revolution with a push to provide skills to 15 million people by 2021. Dubai Cares’ AED 5,510,250 (USD 1.5 million) funding will be equally allocated to two critical 3-year programs managed by WEF’s Centre for the New Economy and Society (CNES). The CNES vision is to build dynamic and inclusive economies and societies that provide a future of opportunities for all. One of the programs focuses on identifying future skills and preparing the education and training systems accordingly, while the other focuses on codifying these future skills in order to transition from the current degree-based into a skill-based labor market. The first program, ‘Closing the Skills Gap: Preparing Education Systems for the Future of Work’, aims to build a network of public-private partnerships in 10 countries initially, to be upscaled to a total of 15 national economies by 2020, over half of which will be developing countries. The program is set to focus on future skills demand and prepare education and training systems to meet the demands of today’s job market. As part of this, the program seeks to invite participating companies to make public, measureable commitments to train, upskill and reskill the current and future workforce. The second program, ‘Shared Vision for Talent in the Fourth Industrial Revolution’, aims to address the growing mismatch between the supply and demand of future skills in the labor market. The program aims to make this model operational by working with key business players, top universities and the EdTech community to adopt a shared taxonomy for skills and pilot the implementation across emerging economies. “We need to break out of the current paralysis and recognize that skills are the ‘great redistributor’. Equipping people with the skills they need is the fuel needed for growth – and to secure stable livelihoods for people in the midst of technological change,” said Saadia Zahidi, Head of the Centre for the New Economy and Society, Member of the Managing Board, World Economic Forum. According to the International Labor Organization’s (ILO) report ‘World Social and Employment Outlook – Trends 2018’, young people under the age of 25 are less likely to find work than adults. The global youth unemployment rate stands at 13%, which is three times higher than the figure for adults, which is 4.3%. This lack of job opportunities is one of the issues of greatest concern. The problem is particularly acute in North Africa, which has the highest rate of young job-seekers. There, almost 30% of young people in working age are unemployed. The situation is also a matter of concern in sub-Saharan Africa, where almost 67% of young workers live in poverty. The Dubai Cares delegation, led by Tariq Al Gurg, Chief Executive Officer attended various high-level events and meetings during the World Economic Forum annual meeting in Davos, which included the Co-Impact luncheon on collaborative philanthropy hosted by Bill Gates, the UNICEF meeting on the role of young people in the fourth industrial revolution, a high-level roundtable discussion on refugee education organized by Save the Children and Community Jameel as well as the Varkey Foundation and the Massachusetts Institute of Technology (MIT) receptions. The delegation also had a number of bilateral meetings with both corporate and philanthropic partners.